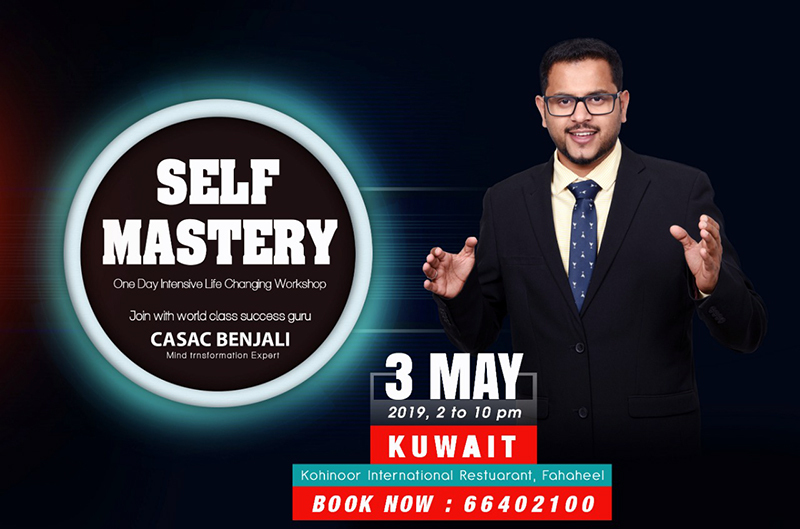 IndiansinKuwait.com - Benjali International Presents Self Mastery - one day mind mastery training session. Benjali International Presents Self Mastery - one day mind mastery training session. Do you want to learn how to become successful in your life?. Do you want to master your mind ?. Would you like to reprogramme your mind and achieve success ? If your answer is YES then you can step into "Kohinoor International Fahaheel " on 3rd May 2019 at 2pm to attend the one day "Self Mastery" training session. Sel Mastery is an intensive training which guides you how to master your mind and achieve success in your life. The session will conduct by Shri.Casac Benjali , a success coach and International Motivational Trainer . He has successfully conducted series of sessions in different countries and helped people to focus on their life and achieve success. Meditation, Affirmation, Visualizations,Goal setting etc are the few key areas you will experience in this session. To ensure your seat please register below or contact +965.66402100 Hurry... seats are limited.